redBus.in is one of the leading website for bus ticket booking. 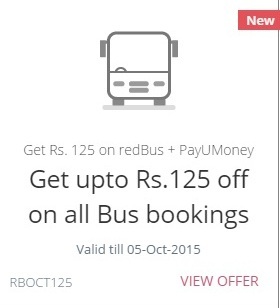 You can now save Rs.125 for the bus tickets booked through redBus via PayUmoney. You can get 15% discount by using the coupon code 'RBOCT125'. Maximum discount is Rs.50. You can additional 15% discount by paying through PayUmoney. Maximum discount is Rs.75. How to avail redBus offer? 2. Login if you are an existing user or register if you are a new user. 3. Select the From and To details. 4. Select date of journey. 5. Select Date of Return(optional). 6. Click on 'Search Buses'. 7. Select bus and seats. 8. Apply the coupon code 'RBOCT125' to get 15% discount to a maximum of Rs.50. 9. Choose PayUmoney for paying the ticket fare to get extra 15% off to a maximum discount of Rs.75. 10. If you are a registered user of PayUmoney, you can login using your login credentials. Otherwise enter your details and register with PayUmoney. 1. redBus offer is applicable only on redBus website, redBus mobile app, redBus mobile website. 2. Current redBus offer is valid till 5th October 2015 only. 3. This offer is applicable only thrice per customer/mobile number. 4. redBus offer is not applicable on state RTCs and some other private bus operators. 6. redBus has right to terminate this promotion anytime. 7. Terms and conditions provided by redBus are applicable.